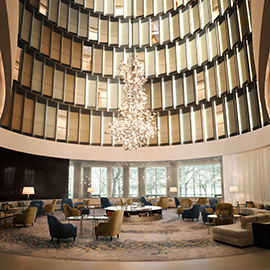 On the occasion of the opening of Hamburg’s newest luxury hotel The Fontenay, Related was in spring 2018 made responsible for planning and executing a series of PR activities in the Danish market to create awareness among Danish travelers. Since Hamburg is only a few hours’ drive from Denmark, the city is a popular city break destination for Danes. The Fontenay is characterized by its round-shaped curves and accommodates state-of-the-art luxury in all aspects from interior to spa and wellness departments. During the six months launch period, Related acted as The Fontenay’s Danish press representative and were responsible for activities such as media dialogue, media pitches and press releases as well as coordinating both individual press trips and a culinary group press trip. The activities resulted in no less than 24 inspirational articles in national newspapers, travel media and lifestyle magazines – with a total readership exceeding 5 million people and a total AVE of more than 117,000 EUR.